The mountain town of Karuizawa is situated on a high plain at the base of active volcano, Mount Asama, in the heart of Japan’s mainland. In 1956, the wine and spirits giant, Daikoku Budoshu, expanded their already established empire there by building a distillery with the onus of producing a single malt to be utilised in the company’s blends. They christened it ‘Ocean’. 1958 saw a freer importation channel opening up for malt, and barley flowed into Japan from the UK. Karuizawa Factory, as it was then known, worked with Golden Promise barley (also famously used by Macallan), and matured their signature spirit in sherry casks, yet very little actually left the country, which in future would lend hugely to its collectability. During the 1980s and 90s Japan's economy was truly booming, but with this prosperity came a generation of young, trendy and affluent consumers who began to turn their backs on companies they deemed “old fashioned”. Instead, their attentions turned to wines, with only low grade, neutral tasting whiskies managing to find any favour as mixing fodder. The relatively small Karuizawa distillery, with its robust and characterful style, never stood a chance, and in the year 2000 it was sadly mothballed (and completely demolished in 2016). Jumping ahead to 2007, independent bottler Number One Drinks acquired the distillery's remaining stocks, and imported Ocean Karuizawa Distillery whisky (as it was re-branded to in 1977) for the European market. The rarity of official expressions, and the now finite supply made for an explosive combination in the world of rare whisky, with die-hard collectors clamouring to get hold of any releases, and driving a buoyant second hand market. The rest, as they say, is history. 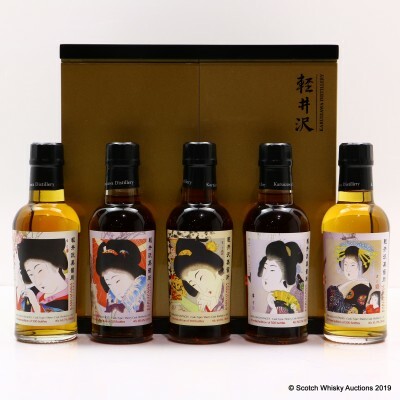 This box-set includes 5 limited edition Karuzawa Geisha whiskies matured in Sherry Casks and bottled in 2017. Every Bottle is one of 500 released.